Th-INK-ing of You: Write your sorrows in the Sand and blessings in Stone! Write your sorrows in the Sand and blessings in Stone! Hello friends! I hope you are enjoying a wonderful weekend! I have a new project to share with you today. This is one of those $1.00 wood frames found at Michael's. I covered the face of the frame with K&Co Blue Awning dp, still one of my all time faves! I then used T Holtz Distress Inks to paint the edges of the frame, and sponge around the edges of the paper. I stamped the image from Our Daily Bread designs The Mighty Sea with Memento Ink and colored with Copics, really not even doing much shading... just letting the image determine the shaded areas! I inserted the picture and some sturdy backing into the frame, then I spread Muddpuddles Malibu Beach onto the sand area in the foreground. While it was wet I added various tiny shells and pressed into the sand. I then let that dry. The sentiment is from ODBD's Count the Waves set. I stamped it on a small shipping label and sponged the edges with distress ink and did the same to the white string that came with the label. I cut a small corner of fishnet for my lower edge, and then tucked some larger shells behind the net, and hot glued some in front of the net. I adhered a piece of corrugated cardboard that I tore, then added the sentiment tag to that. For the outside edge of my frame I used some braided twine ribbon I found at Hancock Fabric. I hot glued that on with a high heat glue stick. I hope you enjoyed this little project! It didn't really take that long and I am pleased with how it came out. Isn't this sentiment great? You know... there is a lot of wisdom in this little sentiment! If we would be willing to let God wash away our sorrows and just hold on to our many blessings, I think gratitude would dominate our thoughts and emotions. It's so hard to let go some times.... those painful things just raise up their ugly heads... but we are indeed sooo blessed, and how wonderful it is to be able to make those the cornerstones of our thoughts! I hope you have a wonderful weekend! Thanks so much for looking... I love knowing you were here! Oh Grace this is just stunning! I just bought that ODB stamp set at convention here in Akron and needed inspiration for using it! So glad you shared it with us at Shelly's Images ... just the inspiration I needed! ABSOLUTELY BEAUTIFUL! Have a fabulous weekend and Thanks so much for joining our "SHOW US WHAT YOU GOT" challenge at Shelly's Images! Please come back and join us again real soon!! This is absolutely beautiful. The Lord truly used you to give me this message when I really needed it. I'm not at all crafty so I'll just repin from Pinterest where I found you. I can enjoy looking at it there. Hanging my laptop on my wall with this pic isn't an option. lol God bless! Thiis is so wonderful Grace. Grace, I do believe this is the most beautiful & touching creation I have ever seen.....all of you special touches just really touch my heart! 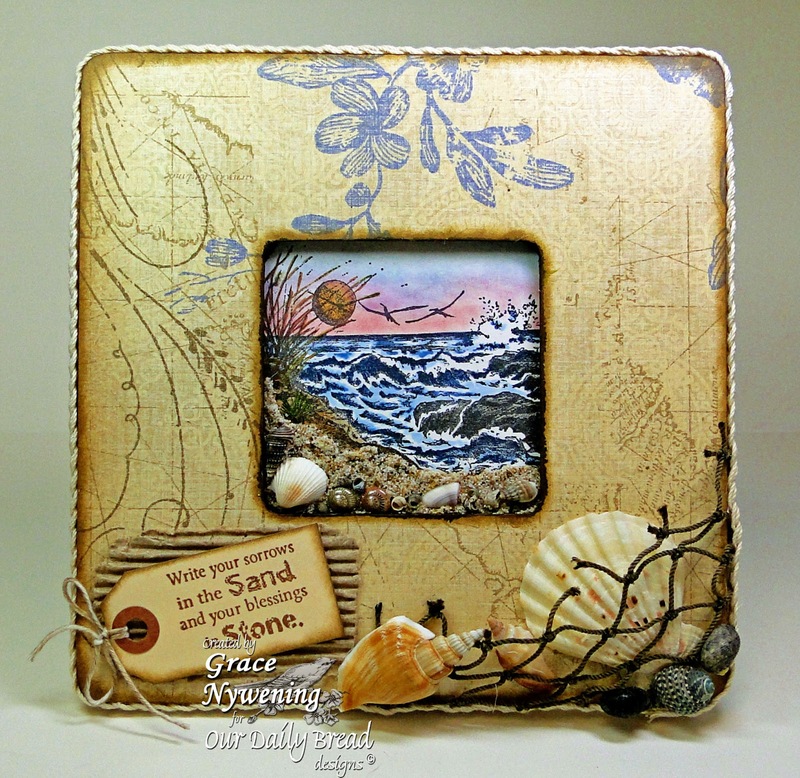 I so love that Mighty Sea set....now I must get Count the Waves as well, lol!!! Thanks for some inspiration this morning!!! Maravilloso trabajo, me encanta visitarte y ver estas preciosidades. Wow, this is beautiful! Love the colors, the shells and piece of a fishing net. And the quote is just beautiful! Thanks for playing along with WAW. This is so beautiful and creative! You did such a wonderful job! I love it! This is breathtaking! What a beautiful color combination! I enjoy all of your posts, however this ONE is very special. A truly beautiful card - so many gorgeous details - I love it! Absolutely stunning! I'm a sucker for beach themes and this is just fantabulous! Grace, this is absolutely stunning!!! I'm so glad you decided to share it with us over at Word Art Wednesday. Gorgeous Grace!! Love your framing and the shells!! Beautiful coloring! !